Ring News 24Boxing NewsMikey Garcia and friends host toy giveaway this Sunday! Mikey Garcia and friends host toy giveaway this Sunday! This year Southern California opened it’s first Boxing atmosphere restaurant, Last Round Bar & Grill, which thanks to the support of many Champions and Boxing Fans has been a huge success! 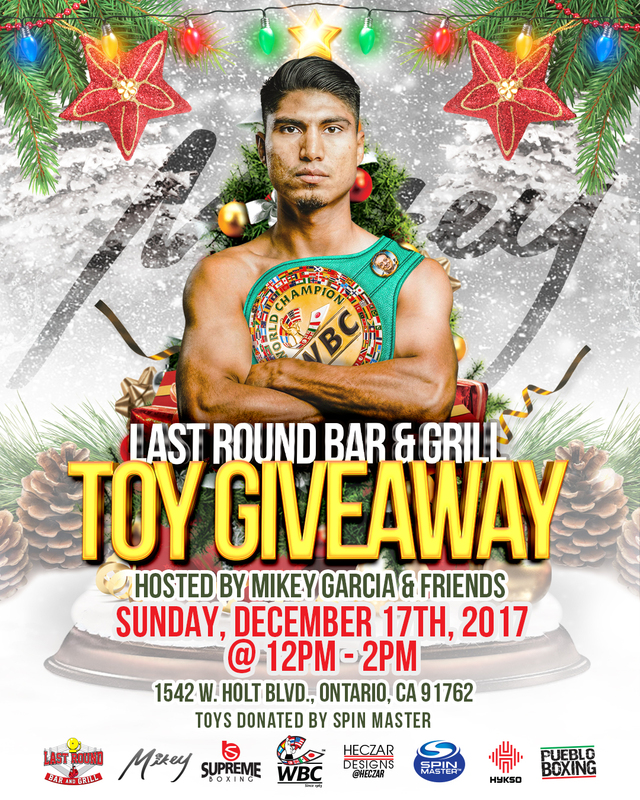 Thanks to that success, December is the Season of Giving and Last Round Bar & Grill teamed up with Supreme Boxing, to hold it’s 1ST ANNUAL TOY GIVEAWAY, this Sunday DECEMBER 17th, 2017 from 12:00pm – 2:00pm located at 1542 W. HOLT BLVD., ONTARIO, CA 91762. WBC WORLD LIGHTWEIGHT CHAMPION, MIKEY GARCIA will be hosting this event along with friends JESSIE VARGAS, WBC WORLD SUPER MIDDLEWEIGHT CHAMPION DAVID BENAVIDEZ, FORMER CHAMPION JOSE BENAVIDEZ, NABF SUPER WELTERWEIGHT CHAMPION DANIEL “EL CHAPULIN” VALDIVIA, RECORDING ARTIST MARTIN CASTILLO and MANY MORE will be announced in the next few days. There will be no cover charge, no fee, this TOY GIVEAWAY is completely FREE for ( any kids in need or in the area, we believe ALL CHILDREN deserve a gift for Christmas. The Champions will be available for photos and autographs as well as giving out toys to the kids. We will also be raffling off prizes for the adults who stick around for the Meet & Greet with the Champs, courtesy of HYKSO. We would like to thank SPIN MASTER for sponsoring the toys for all the children, PUEBLO BOXING, for sponsoring over 200 string backpacks for the gifts, HYKSO for donating their products, RYAN GARCIA AND FAMILY for donating toys for this event, WBC for their support, and of course to MIKEY GARCIA and all the fighters coming to donate their time for this special event! We hope to see you there! Help spread the word as we have many gifts for many children!